Critical thinking (CT) is considered to be foundational for the development of RN clinical reasoning. Reflective journaling has been used as an educational strategy to support the development of CT. This project's purpose was to explore how using reflective journaling about CT dispositions with RNs in a fellowship program might influence RN's use of CT dispositions. This descriptive, qualitative study used content analysis as the method to analyze journal entries focused on seven CT dispositions: inquisitiveness, systematicity, open mindedness, analyticity, truth seeking, CT maturity, and CT confidence written by RNs in the first 7 weeks of their fellowship program. Based on the content analysis of journal entries, two major descriptive themes emerged: Development of Critical Thinking Is a Process That Develops During a Period of Time, and Purposefully Engaging Critical Thinking Dispositions May Help Prevent Negative Patient Outcomes. The purposeful use of CT dispositions as described in the journal entries also helped to guide the RN's individual learning. J Contin Educ Nurs. 2016;47(7):321–329. Critical thinking (CT) has been defined by a variety of researchers. Although differences in definitions exist, it is commonly thought to comprise a set of skills and behaviors that drive thought processes that lead to decision making and actions (American Philosophical Association, 1990; Scheffer & Rubenfeld, 2000; Zori & Morrison, 2009). CT is basic to clinical reasoning, judgment, and decision making and is essential in nursing education and nursing practice (American Association of Colleges of Nursing, 2008; Benner, Sutphen, Leonard & Day, 2010). Finding strategies to foster the development of CT in students and practicing nurses is essential as the profession of nursing is challenged to provide care in a changing environment that is patient centered, focused on safety, based on evidence, and collaborative with other health care professionals (American Association of Colleges of Nursing, 2008; Chan, 2013; Ironside, 2015). Reflective writing is a strategy that has been used in nursing, to foster and internalize ways of thinking, and to influence clinical practice, especially in education (Kennison, 2012). Nurse residency programs have been identified as a best practice for transitioning new graduate nurses into practice. These programs focus on ensuring that participants develop the competencies to deliver safe, patient-centered, and culturally sensitive care that is based on evidence (Letourneau & Fater, 2015; Robert Wood Johnson Foundation & Institute of Medicine, 2010). The Critical Care and Emergency Department Fellowship Program (CCEDFP), where this research was completed, is a 1-year program for new graduates or experienced nurses who will be working in critical care units or emergency departments. The CCEDFP includes didactic and simulation online programs and clinical experiences designed to develop beginning competency in critical care and emergency nursing practice. The teaching project reported here is part of a larger study, reported elsewhere, is primarily quantitative, and is based on critical thinking dispositions in RNs attending the CCEDFP (Zori, Kohn, Gallo, & Friedman, 2013). This qualitative part of the study describes the outcomes of an educational session to foster the development of CT using simulated videos (i.e., scenarios) as an initial illustration. This session was followed by participants' 7 weeks of reflective journaling. Each week, participants were asked for an e-mailed response to describe, from their experiences, their understanding of an example of one of the seven main dispositions discussed in the session, one for each of the 7 weeks (Table 1). The journal entries were treated as narratives, and Krueger's and Casey's (2009) steps in content analysis were used to identify key phrases, subthemes, and eventually themes that best described this process by the CCEDFP participants for learning about and using CT dispositions. CT has been identified as comprising six skills and seven dispositions. A Delphi study conducted by the APA (1990) included a panel of 46 experts in CT who identified the six skills as interpretation, analysis, evaluation, inference, explanation, and self-regulation (APA, 1990). Table 1 shows the seven dispositions identified as systematicity, analyticity, inquisitiveness, truth seeking, CT confidence, open-mindedness, and CT maturity (APA, 1990). This Delphi study is often cited in CT research and is considered a definition of CT (Chan, 2013; Forneris & Peden-McAlpine, 2007; Kaddoura, 2010b; Mundy & Denham, 2008; Scheffer & Rubenfeld, 2000). Nurse educators are challenged to identify strategies for the development and integration of CT in nursing practice (Forneris & Peden-McAlpine, 2007; Ironside, 2015; Kaddoura, 2010a; Kennison, 2012; Mundy & Denham, 2008). Kaddoura (2010b) conducted a qualitative study using a semistructured interview method with 10 new graduate RNs in a critical care orientation program that used clinical simulation as a teaching strategy. Findings from this study suggest that CT skills were strengthened when learners were engaged in clinical simulation. The debriefing process included learners watching their own performance and using questioning and critiquing to learn assessment skills, prioritization, and decision making (Kaddoura, 2010b). Chan (2013) conducted a systematic review of 17 studies of CT in nursing education literature, 14 of which that were qualitative studies and three that were mixed-method studies. From this review, Chan identified four elements integral to operationalizing CT as gathering and screening information; questioning and investigating; analysis, evaluation, and inference, and problem solving and applying theory. Several authors have identified specific strategies when developing CT in nursing education. Burrell (2014) identified evidence-based teaching strategies, such as reflection and questioning, to foster the development of CT and their use in nursing education. Chan (2013) identified teaching strategies for the development of CT to include questioning, reflective writing, and case-based interventions, such as simulation and case studies. Martyn, Terwijn, Kek, and Huijser (2014) found that problem-based learning influenced the development of CT in nursing education. Kennison (2012) described the benefit of using reflective writing assignments to help students internalize the use of reflective writing in their clinical practice. Burrell's (2014), Chan's (2013), and Kaddoura's (2010b) findings stress the importance of questioning in CT development and is consistent with the disposition of both inquisitiveness' definition identified in the APA study (1990) and inquisitiveness and reflection identified by Scheffer and Rubenfeld (2000). In addition, the behaviors and skills identified by Chan (2013) align with those identified by Burrell (2014) and Kaddoura (2010b) and support the CT skills and behaviors identified by the APA (1990) and Scheffer and Rubenfeld (2000). The reviewed literature supports teaching strategies that encourage the development of CT through active learning based on real-life scenarios, clinical simulation, case study discussion, and problem-based learning. There were no studies in the literature reviewed that explored whether reflective journaling about CT influenced the development of CT. Engaging learners through questioning and reflective journaling could strengthen learners' CT skills and dispositions. The purpose of this project, part of a larger study on Critical Thinking Dispositions by Zori et al. (2013), was to explore how the use of the teaching strategy of reflective journaling about CT dispositions might influence use of CT dispositions in a fellowship program. Influence was determined through the analysis of the content in participants' journal entries on each of the seven CT dispositions. The ultimate aim was to identify the entries' descriptive commonalities regarding the participants' understanding of their own experiences of the specific disposition and its meaning to them. 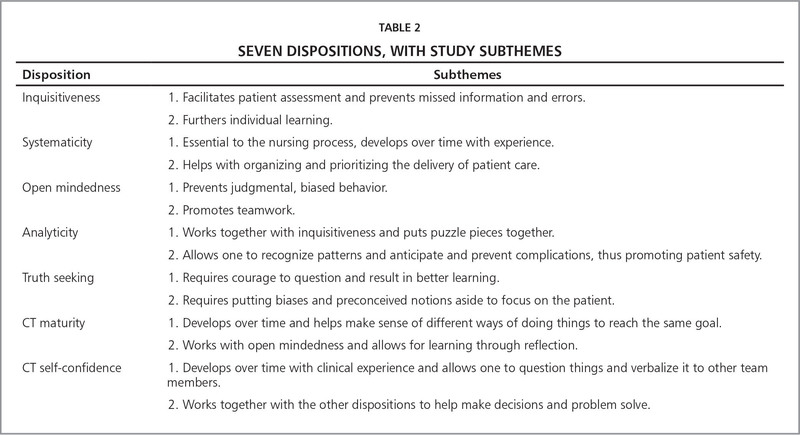 This descriptive study about CT dispositions used the content analysis steps outlined by Krueger and Casey (2009) for participants' journal entries for seven CT dispositions during the first 7 weeks of the program. This step-by-step analysis has been used for interviews, as well as for written narratives. The participants were e-mailed a weekly disposition description and were invited to respond in narrative form using their own experiences and insights related to that disposition and its personal meaning for them as they were engaged in learning the content and competencies required for critical care and emergency department nursing. This project was part of a study undertaken in a large health care system in the northeastern United States. This health care system provides the CCEDFP for nurses from three tertiary hospitals for the education of newly graduated RNs or experienced RNs who are beginning practice in critical care or the emergency department. The program uses a variety of teaching strategies, including simulation, didactic lecture, online learning, and clinical experiences with a preceptor. All RNs who were participating in the fellowship program in 2012 were invited, via invitation letter, to participate in the qualitative project. Institutional review board approval was obtained from the health system where the research was conducted. Inclusion criteria consisted of RN licensure, acceptance into the fellowship program, and the ability to read and write in English. Participants in the program were informed of the study by written letter and consent was given by voluntarily providing an e-mail address to complete journal entries that were e-mailed to the researcher. Withdrawal from the study could occur at any time by not completing or e-mailing journal entries to the researcher. Only the researcher, who was not a member of the CCEDFP faculty, knew which RNs agreed to participate and was the only person who had access to the participants' journal entries, with the exception of the qualitative expert consultant, who assisted with the content analysis process for validation of identified subthemes. The narratives did not contain participants' names. On the first day of the program, with a class of 71 RNs, the author conducted a 1-hour class that defined CT and presented the seven CT dispositions (Table 1) identified in the APA study (1990) and measured in the CCTDI, developed by Facione, Facione, and Sanchez (1994). Three simulated videos were used to describe commonly encountered clinical situations and for group discussion of the seven CT dispositions. For example, the group discussed one scenario that depicted a patient with chronic pain, whom the staff had labeled as a “drug seeker,” a second scenario portrayed a non-English speaking patient who told her family she was being tortured by a nurse, and third scenario depicted a dying patient whose two children did not agree on the course of treatment for their mother. After the completion of the class, the researcher e-mailed all of the participants each week for 7 weeks a descriptor of one of the seven CT dispositions. The descriptors were sent to participants in the order listed in Table 2. The participants were invited by e-mail to respond with a journal entry describing their clinical or simulation experiences with a specific CT disposition identified and defined, one each week. A total of 71 participants attended the class on the first day and completed the demographic survey. However, as outlined in the voluntary participation criterion, not all of these participants submitted responses to the e-mail. The number of journal entries submitted for each of the CT dispositions were: inquisitiveness, 56; analyticity, 55; truth seeking, 58; systematicity, 46; CT maturity, 42; open-mindedness, 43; and CT self-confidence, 38. Because the responses were anonymous, the number of participants who completed responses to all seven of the dispositions was not known. As the 7 weeks of the study progressed, fewer participants responded to the e-mail invitation to journal. Follow-up e-mails were not sent by the researcher. However, the number of responses, length of the entries, and depth of the responses from the participants provided enough data for analysis. The unit of analysis for this study was the phrase, rather than the participants, and there were more than sufficient phrases for analysis. The journal entries were analyzed by qualitative inductive content analysis to identify key themes that described RN fellows' perceptions of CT dispositions. The journal entries were read several times by the researcher, and key phrases were first coded. The initial coding of the entries was validated by a researcher with expertise in qualitative methods. Coding was undertaken separately to ensure that meaningful phrases were identified. Next, like-coded phrases were categorized, and categories were given an initial descriptor. Some categories were further reduced, resulting in subthemes for each of the seven dispositions (Table 2). Following Krueger's and Casey's (2009) method, the subthemes were reviewed to search for overall themes that the authors describe as an explanation of the big picture. After reviewing the subthemes, two major themes emerged that best explain the overall CT process as perceived by the participants. Each theme, and each disposition's subthemes, are presented with supporting journal entry remarks. The study took place in one CCEDFP that used a combination of simulation, didactic, online, and clinical learning experiences. All, or any, of the teaching strategies used could influence CT development and cannot be linked solely to reflective journaling. The subjectivity of the researcher while reading, selecting, and coding phrases from the journal entries may be another limitation of the study. However, with independent coding and further validation by an expert, biases can be viewed as somewhat mitigated. This project, and the initial larger quantitative study, did not include the use of a satisfaction survey about the journaling process and the participants' experiences. This may have provided some insight about its usefulness from their perspectives. It also might have shed some light on possible reasons why some did not participate or chose only to respond to some of the weekly dispositions. Although the teaching intervention did not measure specific learning outcomes, its usefulness is validated by the examples participants gave of each disposition. However, because the e-mail responses were anonymous and were not from all of the 71 participants in the program who completed a demographic form, a description of the gender, ethnicity, and experience, among others, of those participating in this qualitative project is unknown. Additional verbal feedback from the participants about the reflective journaling experience was not solicited. The researcher was not a member of the CCEDFP strategy and did not meet with the participants to verbally solicit feedback about the experience. The purpose of the project was to gather descriptions of participants' experiences with CT dispositions. A total of 71 participants completed the demographic survey at baseline. 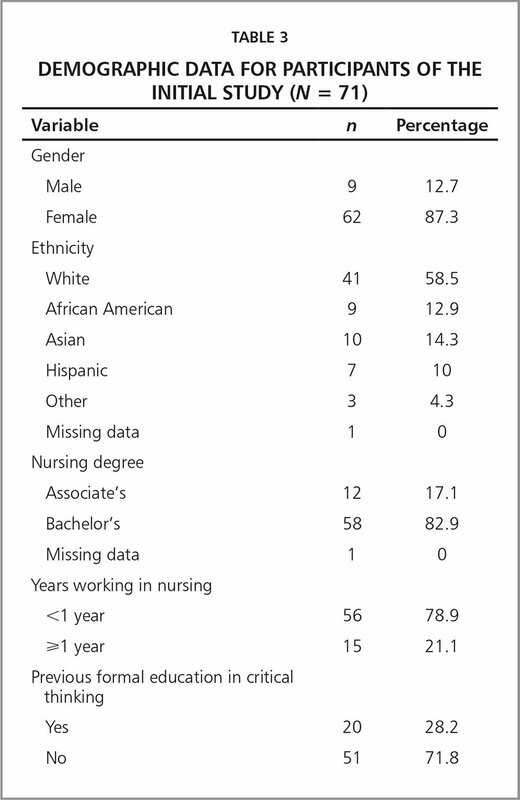 As shown in Table 3, the participants (n = 71) were predominantly women (87.3%), were Caucasian (58.5%), held a BSN degree (82.9%), had less than 1 year of nursing experience (78.9%), and had no formal CT education (71.8%). The demographics of the RNs in the program who participated in this qualitative project as noted earlier are not known. The subthemes for each disposition emerged from the categories coded as responses under each of them (Table 2). Each of these subthemes captured the majority of the written narratives for a disposition that had been categorized. Although these are lengthy titles for subthemes, they were not interpretations and thus are written as category descriptors rather than shorter identifiers. Narrative versus verbal interview data can differ when trying to capture meaning because an interviewer is not present for questioning or clarifying, and therefore the initial sentences were used without much clarification or qualification. Two major themes were identified through further analysis of the subthemes for each of the seven disposition responses and represent the big picture (Krueger & Casey, 2009). The first major theme, that CT Is a Process That Develops During a Period of Time, was evident in the journal analysis of the subthemes related to the dispositions (Table 3). Participants often mentioned CT as a development or as a process, indicating that it was evolving or had movement, and further journaled using phrases such as “over time,” or “in the beginning,” or by describing specific differences in their behavior or thoughts from one point in time to another. Each of the seven dispositions' subthemes is supported below with journal entries that capture the meanings of the participants. Some used examples of actual patient experiences to underscore their understanding of the disposition in CT. I was in the emergency department when a patient came in complaining about feeling generally unwell. Since this is a complaint that is not taken seriously especially when combined with perfect [laboratory] results, it would have been very easy for this patient who was in his 20s to be sent home fairly quickly. I felt there must be a reason that this patient brought himself to the emergency department, and so I sat down with him to have a more in-depth conversation about what was happening. After a period of time, the patient started to open up more and started to cry…. It turned out he was suicidal. Without [my] being inquisitive, the patient would have been discharged too soon…and possibly could have ended his life. I found being inquisitive can be intimidating as a new [graduate]. As the week progressed, I felt more comfortable asking questions. I realized this is a learning experience and I am the one in the driver's seat. If I want to get as much out of this experience, then I must be as inquisitive as possible. It is all too common to see nurses that have patients with disorders they are not familiar with and they do not seek out an understanding of what their patient has. My patient had CLL [chronic lymphocytic leukemia], I was unfamiliar with the term as well as the disease, but I knew the extremely elevated white count must be part of the issue. I immediately stopped and researched through Medscape what CLL was and applied it to how I should be taking care of the patient. Not knowing about his disease was not an option. Nurses must pay attention and be aware of problematic situations by using the disposition of analyticity. Things such as vital signs, [laboratory] values, and patient observations are indicators of a possible negative outcome. Nurses must be investigators. They need to analyze information and use it to avoid a negative situation. In the excerpts below, the participant describes the important elements of truth seeking—the courage to overcome a feeling of weakness in not knowing, taking a risk, and going beyond preconceived notions that can result in a change in diagnosis and treatment plan for a patient. I think an everyday hard question is simply contemplating when to ask for help.... As we progress in our nursing careers and acquire more skills some may look at asking for help as being incompetent or as a weakness. Asking for help is not the easiest thing to do. My patient was complaining of bilateral leg pain [she rated as an] 8 out of 10. The doctors were saying that she must have some sort of arterial or venous thrombosis and [laboratory] and diagnostics would be done. The patient continued to complain of pain…. Her legs were swollen, red, warm, and inflamed and the pain medication was not working…. My preceptor began searching on the computer for other conditions with similar symptoms and a few things came up…. She told the doctor that maybe something else was going on…and suggested doing a full [laboratory examination]. The blood results showed a high uric acid [level] and it was determined the patient had gout and received appropriate medication.… My preceptor was courageous enough to say to the doctors, “Hey this isn't working, something else is going on,” and in the end we uncovered the truth. I really need to become more focused and detailed in obtaining patient histories, I need to make sure I cover all of the systems and not just the one that is pertinent to the problem. I feel like this is a skill that comes with time as you see the same disease processes over and over. You have a diabetic patient and the blood sugar is very low, the nurse on the morning shift started a new medication [beta blocker] that masked the signs of hypoglycemia in a diabetic. Now you are at the start of your shift and you catch the missed signs, you need to be detail oriented and systematic in your approach to fixing his hypoglycemia in order to not cause additional problems/chaos. As a new nurse, I have not reached this level of maturity yet. I realize I often become frazzled and frustrated when what I know and understand to be right does not apply to a situation at hand. Yet I see many nurses who understand if one solution does not work there are many others to try. This can only come with practice and experience. I believe I made a very good connection with this patient, putting aside my beliefs on substance abuse. Health care professionals often judge too quickly those with substance abuse issues…. It is important that we remove any judgments about why or what the person is doing. This opens communication and we can better care for the patient. Nurses do not always agree with what other nurses have to say, but it is important to remember we are all a team at the end of the day. There is a huge difference in a caregiver who has an open mind and those who do not. It brings a very different dynamic to the team. I think that self-confidence is a process and there is always room to gain more and improve. You definitely have to trust yourself and know what you are and are not capable of doing. You have to know when to ask for help and be able to trust others to help you. CT is on-going and in order to become better you must trust yourself. This week I picked up a [medication] documentation error made by my preceptor…. I felt as though I had the self-confidence to remind my nurse that our patient was actually getting double the dose that was being documented. At the end of the 7 weeks of journaling, one of the RN fellows wrote about using the various CT dispositions of open mindedness, CT confidence, and analyticity together to allow one to venture out of the norm for problem solving. Over the past 7 weeks I feel as though I am beginning to see the real definition behind CT. It is being able to open yourself to possible pathways, the ideas of others, anticipate various scenarios you are brought into and be confident in your abilities to think outside the box. Many of the participants in this study were able to describe that purposely using CT dispositions, and valuing them, influenced their individual learning, as well as more positive patient care outcomes. They believed that being inquisitive and persistent in truth seeking, as well as being analytical and systematic in assessing patients, led to uncovering additional information that, when being confident enough to share this information with the health care team, changed the course of treatment. These interventions and changes of plan were, at times, lifesaving. Focusing on the use of CT dispositions through reflective journaling is consistent with other researcher's findings. Burrell (2014) described reflection as an active process that helps learners connect theory and practice. There is also consistency with Chan's (2013) findings that reflective writing was shown to have a positive effect on CT. The participants of this study describe many instances where reflecting on CT dispositions influenced their clinical reasoning. This is consistent with Benner et al. (2010) who described the use of critical reflection in developing clinical reasoning. A study by Forneris and Peden-McAlpine (2007) used a case study approach to journal writing, in which RNs who were in a 6-month orientation program described the change of thinking from being rule-driven to purposely choosing to use CT as the clinical situation demanded. As the RN fellows progressed through the 7 weeks of the project, as well as the CCEDFP, many wrote entries that described how the various CT dispositions worked together to facilitate better individual learning, as well as better patient care. For example, they described how inquisitiveness, together with analyticity and truth seeking, helped them to better assess and uncover important information about their patients. This newfound understanding, combined with CT self-confidence and CT maturity, led to the RN fellows having the courage to speak up and share the information with the health care team. The participants also described how developing CT takes time and experience and is a process—one of the two major themes identified. This is consistent with Benner's (1984) description of a nurse moving from beginner to expert with the expert, able to use CT to synthesize all contextual information to intuitively make decisions about patient care. Forneris and Peden-McAlpine (2007) described the emergence of a critical thinker that occurred during a period of time and was exhibited by intentional CT to gather all information and turn it into interventions that affect patient care. Reflective journaling was an educational strategy used to enhance the use of CT by RN fellows as they learned to deliver patient care. This could be a useful strategy for professional nurse educators who educate nurses as they transition from students to practicing RNs as well as those in the academic setting who are teaching nursing students. Recognizing that using, and knowing when to use, CT is a choice. Although it can be challenging at times, reflective journaling about CT dispositions may help nurses internalize aspects of reflective practice, thus supporting the use of CT as they move through their career. Reflective journaling may not be a useful learning strategy for all participants. In this study, many of the participants wrote thoughtful, thorough journal entries, although some were cursory, brief, and lacking in reflection. As the RNs progressed through the 7 weeks of the study, the number of journal entries steadily declined from week 1, with 56 journal entries submitted, to week 7, with only 38 entries submitted. Often, students preparing for professional practice do not have the opportunity to use reflective journaling and might be foreign to them, perhaps raising anxiety. Journaling also requires self-assessment, and given that this program was an educational one, revealing one's “weaknesses,” as some participants called it, may have been viewed as jeopardizing the evaluation of their achievements, despite the researcher not being involved in the academics of the program or grading the students. Self-awareness, an outcome of reflective journaling, was not measured in this study. Therefore, multiple educational strategies that support the development and use of CT should be used in professional education and would be beneficial to nurse educators. Additional feedback from the participants about the reflective journaling experience or journal entries was not solicited, either through satisfaction surveys or verbally by meeting with the participants. Feedback was also not obtained regarding the participants' interpretations of the dispositions or their views of the experience of journaling itself. This may have also affected the number of entries, the type of entries, or the number of fellows participating. The participants may have experienced this as a one-way learning method, not an engaging one, which is unusual in nursing education. The purpose of this teaching project was descriptive in its aim and not intended to be interpretive. However, this is an important consideration for future research. Few studies have reported on the use of dispositions to develop CT. This study can be replicated and should include feedback both to participants about their entries and from participants about their journaling experience and their learning. It is suggested that future studies assess whether the learning during a similar program is internalized and used during a period of time. Additional research to explore the ways to develop CT in nurses who are transitioning to clinical practice. Repeating this study with other types of educational programs that transition nurses to clinical practice would be important as the discipline continues to seek ways for developing clinical reasoning and would add to the body of knowledge on the use of reflective journaling, as well as what is known about CT development. The results of this study described how RNs in a CCEDFP who engaged in reflective journaling about CT dispositions purposefully used the CT dispositions and valued them for providing safe patient care. The purposeful use of CT dispositions not only guided the RN's individual learning, but may have helped reduce errors and negative outcomes. Reflective journaling was a strategy that assisted participants in learning the elements of CT, but it is unknown whether these dispositions were internalized and used by participants as they progressed through their careers as RNs. Similar studies that use reflective journaling with feedback from participants are warranted. American Philosophical Association. (1990). Critical thinking: A statement of expert consensus for purposes of educational assessment and instruction. Millbrae, CA: The California Academic Press. Benner, P. (1984). From novice to expert. Menlo Park, CA: Addison-Wesley. Benner, P., Sutphen, M., Leonard, V. & Day, L. (2010). Educating nurses: A call for radical transformation. San Francisco, CA: Jossey-Bass. Facione, N.C., Facione, P.A. & Sanchez, C.A. (1994). Critical thinking disposition as a measure of competent clinical judgment: The development of the California Critical Thinking Disposition Inventory. Journal of Nursing Education, 33, 345–350. Krueger, R.A. & Casey, M. (2009). Focus groups: A practical guide for applied research (4th ed.) Thousand Oaks, CA: Sage. Scheffer, B.K. & Rubenfeld, M.G. (2000). A consensus statement on critical thinking in nursing. Journal of Nursing Education, 39, 352–359. Zori, S. & Morrison, B. (2009). Critical thinking in nurse managers. Nursing Economic$, 27(2), 75–79, 98. Facilitates patient assessment and prevents missed information and errors. Essential to the nursing process, develops over time with experience. Helps with organizing and prioritizing the delivery of patient care. Works together with inquisitiveness and puts puzzle pieces together. Allows one to recognize patterns and anticipate and prevent complications, thus promoting patient safety. Requires courage to question and result in better learning. Requires putting biases and preconceived notions aside to focus on the patient. Develops over time and helps make sense of different ways of doing things to reach the same goal. Works with open mindedness and allows for learning through reflection. Develops over time with clinical experience and allows one to question things and verbalize it to other team members. Works together with the other dispositions to help make decisions and problem solve. Dr. Zori is Clinical Assistant Professor, Adelphi University College of Nursing and Public Health, Garden City, New York. The author thanks Dr. Jane White for reviewing the methodology, validating the themes that emerged from the journal entries, and assisting in providing language assistance and proofreading of the article; Dr. Kathleen Gallo for providing administrative approval and assistance; and Dr. M. Isabel Friedman, for helping in the collection of data for this study. Address correspondence to Susan Zori, DNP, RN, NEA-BC, Clinical Assistant Professor, Adelphi University College of Nursing and Public Health, 1 South Avenue, Garden City, NY 11530; e-mail: szori@adelphi.edu.